I realize it’s not the time for goulash, at least not where we live. But, having just spent a week in Colorado. I also realize this classic Hungarian dish could come in quite handy mid-August. Highs of low 60’s in the middle of the day, cooling down to 40-something in the evening? That’s goulash-friendly all the way. Come to think of it, using the crock pot in the summer is a pretty nice way to approach cooking. And yes, I’ve been known to enjoy a hearty beef stew in Kansas at the height of the summer and not even feel awkward about it. It is not a common meal for us during this season, but when I get that craving for comfort food, I listen to my body and go for it. Season the pieces of beef with salt and pepper and reserve. In a small skillet, heat the oil, saute the shallots until translucent, add the paprika, tomato paste, garlic, and caraway seeds. Stir until fragrant, transfer the mixture to the slow-cooker. Add the chicken stock, soy sauce, tapioca, and bay leaves. Place the seasoned beef over the sauce, mix it to coat the pieces. Cover and cook until beef is tender, 9 to 11 hours on low. Discard bay leaves. In a bowl, combine 1 cup hot stew liquid with sour cream, then stir the mixture into stew. Adjust seasoning with salt and pepper. Serve with fresh parsley sprinkled on top. Comments: If you happen to own this product reviewed a while ago by Mimi, definitely put it to use in this recipe. I have used it in the past, but ran out of it and completely forgot to re-order, Not the type of ingredient easy to find where we live. As to the recipe, do not get pre-cut stew beef. It is simply not the same as getting a beautiful, marbled piece of chuck roast and cutting it yourself. Especially using the crock pot for so many hours, it makes a difference in the texture of the meat. The packages sold at the grocery store are usually cut too small and often go through some process to tenderize them. No bueno. mashed potatoes go superbly well with it, no doubt! Heavens! Having been married to a Hungarian nobleman and superb chef for over four years I would not have dared to say ‘no’ to ‘goulash’ in its many forms at any time whatever the season 🙂 !! I suppose ‘goulash soup’ was oft the party dish regularly made and served by his Lordship to thirty, forty or more!! !!! Served with csipetke or noodles most of the time ! Have to smile that eight kilo containers of different paprikas sat on one of our kitchen shelves at any one time – like good wine one had to learn the difference on one’s palate!! To each their own, but I would try different mixtures in the middle-range, omit the soy sauce and, health notwithstanding, add a lot more sour cream 🙂 ! Make it heaps more ‘gutsy’ than the American Test Kitchen 🙂 !! Our weather has been pretty wonky and with so much rain it was comfort food time, I made country captain! I get sick of summer cooking at time and with the rain, comfort good is the way to go. 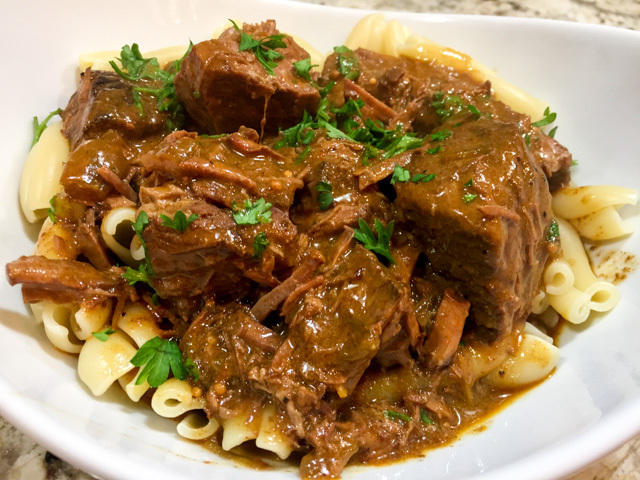 I would double it – goulash is pretty hearty, but I think this portion would serve 4 to 5 people comfortably…. We make nokedli with our goulash. It’s still Winter where I live, Sally and your goulash is timely.